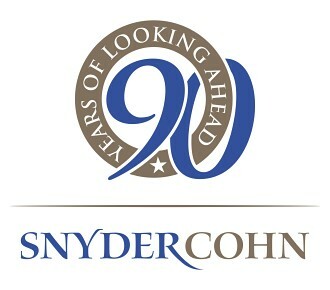 Congratulations to Eddie Snyder, CPA, W'68, a past Joseph Wharton Award recipient, and Chairman of Snyder Cohn, PC, o n his firm’s 90th anniversary! Founded in 1927, Snyder Cohn provides accounting and business advisory services to business owners and organizations in the Washington, DC Metro area. Snyder Cohn associates support and volunteer at various charitable organizations in the local community. We would like to spotlight some of these organizations below (from the Snyder Cohn website). In celebration of their 90th anniversary in 2017, Snyder Cohn associates accepted a challenge of donating 1000 pounds of food for MANNA in one month. Given the friendly competition amongst firm teams, we more than tripled this goal and achieved 3070 pounds of donated food! One of our volunteer partnerships is with the Montgomery County Coalition for the Homeless (MCCH). We were paired with Forest House, a shelter that is part of the MCCH “Hope Housing”, a program that provides permanent supportive housing to formerly homeless individuals with disabilities. Shown are some photographs from our recent spring yard clean-up and planting project. We put mulch down in several areas and planted a variety of plants and flowers around the yard. We also planted various herbs and vegetables in pots so that Forest House can have a deck garden. Please click on the link for more information about this organization: www.mcch.net. Multiple associates of Snyder Cohn are actively involved with this organization, which provides customized, community-based support to individuals with development disabilities to direct their lives with dignity, choice, authority, and responsibility to achieve lives reflective of their desires. We were honored to attend their gala in April celebrating their 25th anniversary! Please check out the link for more information on this wonderful organization. www.seeconline.org. In May, Debbie McGregor attended an event to support Montgomery Kids, the pediatric program at Montgomery Hospice. They provide compassionate, professional care for children who have a life-limiting illness. Montgomery Hospice supports the children in their homes surrounded by family friends and the things that they love. The Montgomery Kids team is a dedicated, interdisciplinary group of trained professionals who work with the children, their families, and their doctors or other caregivers. Click here for more information: www.montgomeryhospice.org. See www.snydercohn.com for more information on these topics or the firm's services and awards.